Appearance: The senet board consisted of thirty squares in three rows of ten. The last five squares generally were marked with hieroglyphic symbols. During the Old Kingdom, each of the two players had seven playing pieces. Later on, this number was reduced to five pieces each. In fancier New Kingdom sets, the pieces were sometimes made in the form of kneeling, bound captives. Movement of the playing pieces seems to be determined by tossing knucklebones or sticks with different colored sides, similar to modern games which use dice. The rules of play are not exactly known. Meaning: The senet game was connected to the afterlife. 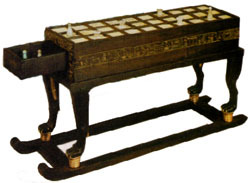 Senet boards were often placed in tombs (Tutankhamen was entombed with four, it is assumed that the game was a favorite of his). The game was supposed to be a pasttime for the deceased. However, symbolically the game also was connected with the attainment of the afterlife by the dead. In many tomb paintings and Book of the Dead illustrations, the deceased is shown playing the game with no visible opponent. It may be that in these cases, the person is playing against the powers of the beyond. Winning against these opponents may lead to good fortune in the afterlife.